Background and Objective: Urinary tract infections lead to increased hospitalization, direct patient costs, and mortality. Data on the prevalence of common uropathogens and antimicrobial (AM) susceptibility pattern are sparse and it varies geographically. Our aim was to determine AM resistance patterns in a tertiary urological center. 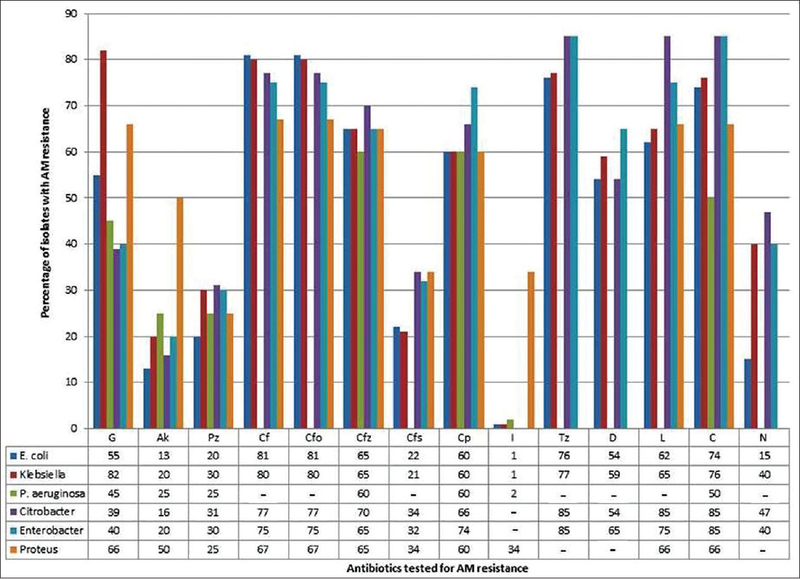 Materials and Methods: Data on bacterial uropathogens and AM susceptibility between January 2015 and January 2016 in 1080 significant bacterial isolates were analyzed. Results: The most commonly isolated bacteria were Escherichia coli in 720 (66.6%), Klebsiella species in 170 (15.7%), and Pseudomonas aeruginosa in 80 (7.4%) patients. E. coli from inpatients was susceptible to imipenem (260; 97%), amikacin (212; 79%), piperacillin–tazobactam (206; 77%), nitrofurantoin (198; 73%), and cefoperazone–sulbactam (206; 77%). Klebsiella isolates were sensitive only to imipenem, piperacillin–tazobactam, and cefoperazone–sulbactam. Pseudomonas and Proteus species were sensitive only to imipenem and piperacillin–tazobactam. In outpatients, the common uropathogens showed lesser resistance only to nitrofurantoin (15%–47%). Conclusions: E. coli and Klebsiella are the most common uropathogens. Nitrofurantoin should be the drug of choice in outpatients. In inpatients, beta-lactamase inhibitors and amikacin have good AM sensitivity. Carbapenems should be the first choice AM agents in the intensive care unit. Background and Objective: The aim is to study the efficacy and safety of flexible ureteroscopic lithotripsy (fURSL) for renal stone with persistent urinary tract infection (UTI). Materials and Methods: We retrospectively included 15 cases of patients diagnosed with renal stone together with persistent UTI, who were treated with fURSL from October 2011 to June 2015. 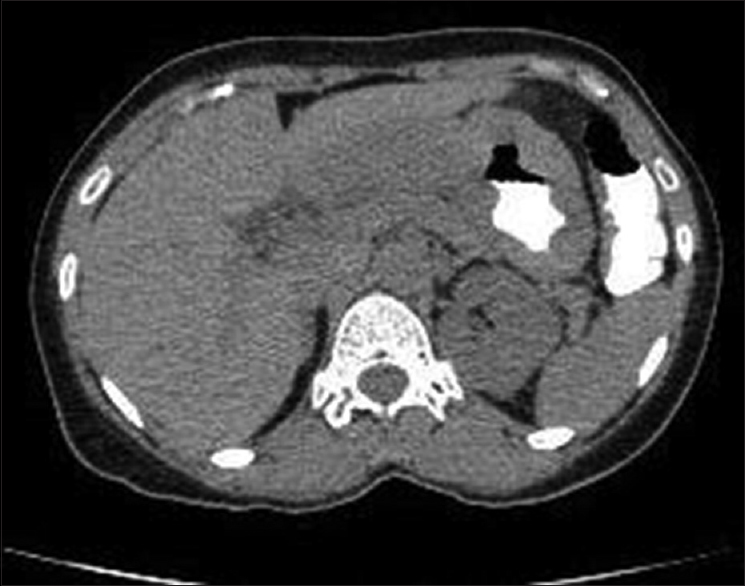 A group of 15 patients diagnosed with renal stone, without any sign of persistent UTI, were set as control group. Standard fURSLs were performed by two experienced urologists. Vital signs, routine blood test and kidney, urine, and bladder were observed as well. The double J stent was removed 2–4 weeks after the operation. Results: All operations were done in one-stage. In UTI group, the average operation time was 30 ± 21 min (15–50 min). The stone-free rate (SFR) was 93.3% (14/15). Two cases (13.3%) of fever were observed after the operation, all happened within 6 h postoperatively, with the highest temperature of 39°C. All patients were cured with antibiotics. Conclusions: It is safe to perform fURSL on renal stone patients with persistent UTI under the protection of sensitive antibiotics. The SFR and postoperative complications were acceptable. Low-pressure irrigation and careful postoperative observation are of great importance for these patients. Background and Objective: Cyst infections often develop as a complication in patients with autosomal dominant polycystic kidney disease (ADPKD). Although this complication has significant clinical implications, reports of cyst infection are extremely limited. 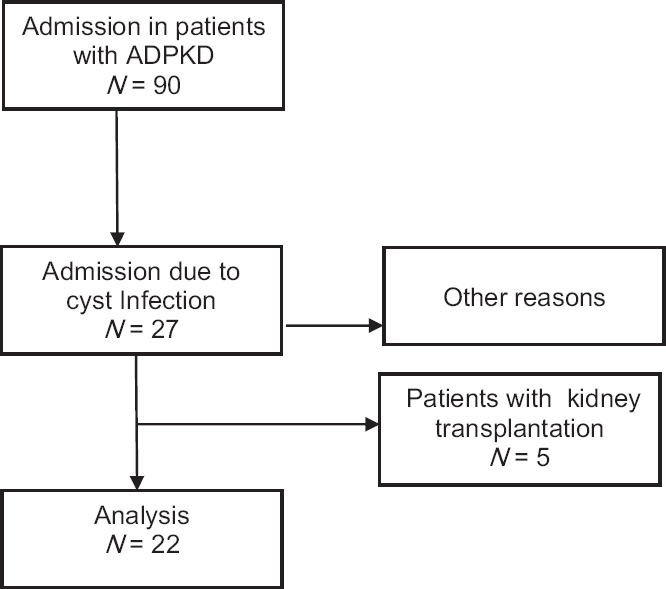 Herein, we report on the status of cyst infection in patients with ADPKD to clarify this. Materials and Methods: Among 90 patients with ADPKD admitted to our hospital from 2010 to 2017, we selected those diagnosed with cyst infection. We collected the data from medical record retrospectively. Results: A total of 22 patients, comprising 12 men and 10 women, were included in the study. Infected cysts were identified on imaging in six (27.3%) patients. Bacterial culture was positive in 12 (54.5%) patients. The initial antibiotic treatment was quinolone, cephalosporin, carbapenem, and vancomycin in 7 (31.8%), 11 (50%), 3 (13.6%), and 3 (13.6%) patients, respectively. The mean hospitalization period was 12.0 days (range, 9.25–14.75), while the mean antibiotic treatment period was 26.5 days (range, 21.25–29.50). No patient died. Nine (40.9%) patients had previous episodes of cyst infection, and 11 (50.0%) had recurrence during the study period. The rate of prolonged hospitalization longer than the median of 12 days was higher in patients with maintenance dialysis, although the difference was not significant (80.0% vs. 50.0%, P = 0.1453). In multiple regression analysis, the albumin value showed a negative correlation with the hospitalization period (β-coefficient: −0.4835, 95% confidence interval: −15.5757–−0.9460, P = 0.0290). Conclusion: Patients with ADPKD who have a poor nutritional status may require additional medical attention to avoid prolonged hospitalization. Background and Objective: Sjogren's syndrome represents a group of diseases characterized by inflammation and destruction of exocrine glands. Renal involvement in Sjogren's syndrome has been reported in 18.4%–67% of patients. Distal renal tubular acidosis (RTA) was reported more common than proximal RTA which can present as acute hypokalemic paralysis. 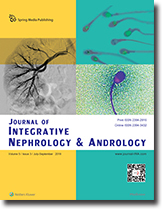 The aim of the present study was to investigate the clinical picture and the outcome in patients with primary Sjogren's syndrome (PSS) with significant renal involvement. Materials and Methods: We conducted a retrospective study of PSS patients with significant renal involvement in our department. Results: A total of 27 patients were included in the study. The mean age was 39.3 ± 4.5 with a mean follow-up of 42 ± 4.8 months. About 18 patients had hypokalemia associated with paralysis, and 4 patients had hypokalemia without paralysis. Female: male ratio was 12.5:1. Number episodes of hypokalemic paralysis range from 1 to 4. The mean time of recovery was 20.4 ± 4 h, and mean potassium requirement was 190 ± 45 mEq intravenously. The mean serum potassium was 2.51 ± 0.55, mean urinary potassium 32 ± 2.3 mEq/day, mean serum bicarbonate 15.03 ± 1.05 mEq/l, and mean blood pH 7.28 ± 0.9. About twenty had distal RTA, and two had proximal RTA. The clinical symptoms were myalgia in 24 (88%), ocular symptoms in 20 (74%), muscular paralysis (66%), oral in 18 (66%), and dental caries in 12 (44%). Five patients underwent renal biopsy of which two showed acute interstitial nephritis, one showed chronic interstitial nephritis, one showed membranoproliferative glomerulonephritis, and one acute tubular injury. Conclusion: The clinical implication of our study is that distal RTA is a common feature of Sjogren's syndrome presenting predominantly as hypokalemic paralysis. 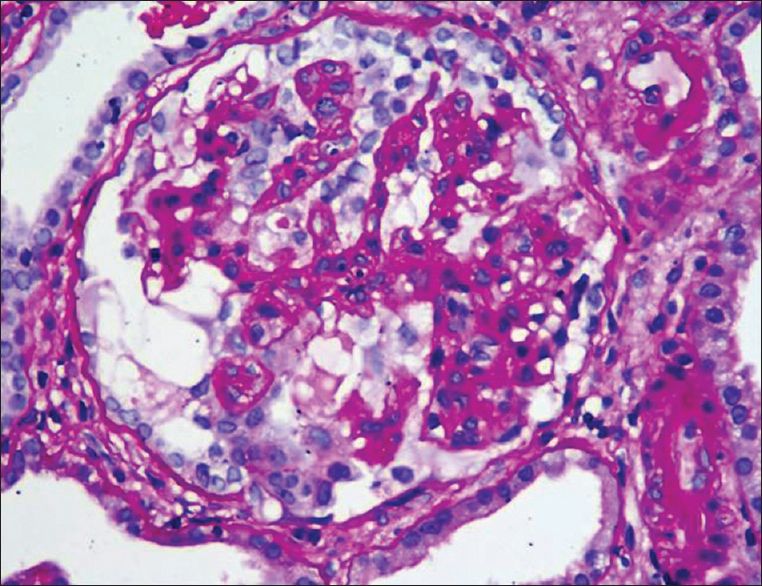 Primary IgA nephropathy (IgAN) is the most common primary glomerulonephritis globally. Its epidemiology, clinical presentation, histology, and prognosis vary widely. 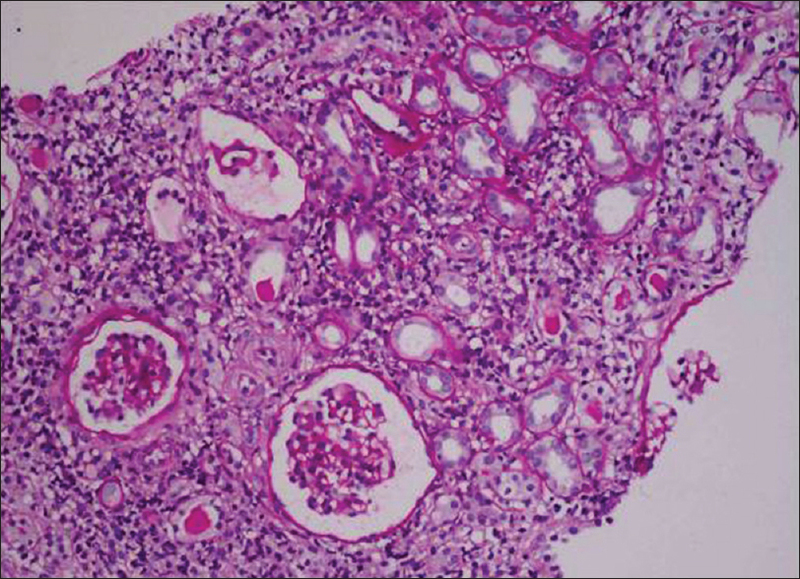 Focal segmental glomerulosclerosis is frequently seen in IgAN and is an indicator of poor prognosis. Collapsing glomerulopathy (CG) associated with IgAN is rarely seen, and its treatment and prognosis are largely unknown. We present here, two male patients presented with renal failure and nephrotic syndrome. Renal biopsy in the first patient revealed CG with IgAN with significant interstitial fibrosis and tubular atrophy and hence treated with supportive therapy. In the second patient, concomitant CG and IgAN were diagnosed and started on oral steroids and had partial improvement. Posttransplant lymphoproliferative disorders (PTLDs) are rare complication encountered in solid organ transplantation. They can be fatal and often occur within 1 year of transplantation. Often, they are associated with Epstein–Barr virus (EBV) reactivation occurring in a setting of immunosuppression. Among PTLDs, Burkitt's lymphoma is uncommon. In this report, we present a renal allograft recipient who presented with late-onset PTLD like Burkitt's lymphoma, 12 years after renal transplantation, and was negative for EBV markers. The clinical presentation of PTLD is often subtle as it usually involves the extranodal sites. The gastrointestinal system is one of the frequent sites involved by PTLD. The diagnosis is confirmed by histopathological analysis including immunohistochemistry (IHC) of the suspected lesion. Analysis for the EBV status of the tumor is of major significance in predicting prognosis. Late-onset PTLD is usually monomorphic and the prognosis is poor if the EBV status is negative. Reduction or even withdrawal of immunosuppression is the pivotal step in the treatment of PTLD along with the use of chemotherapeutic agents and rituximab.